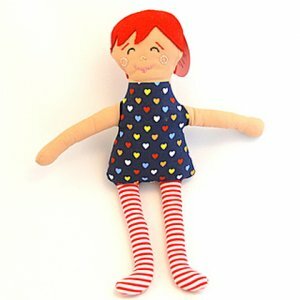 Poot & Boogie eco-friendly dolls are individually handcrafted from cotton and wool. The dolls are stuffed with corn-derived fiberfill, and each one is unique. These dolls are made in Aldergrove, BC, and they remind me of Raggedy Ann and the dolls children played with before plastic dominated the toy world. In our home they are the king’s crown for when he goes frog hunting and often they are the “smoothie man’s” hat during kitchen play – the possibilities are endless. 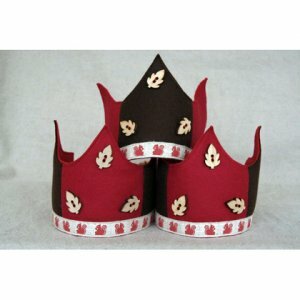 Be it for a Birthday celebration or imaginative play these crowns are sure to add some magic. We are delighted to be working alongside two celebrated Canadian designers to create unique additions to our product line that are earth friendly and inspire creative play. Working directly with designers provides Natural Pod the opportunity to respond to customer feedback with unique and fun products that encompass our philosophy of promoting open play through natural toys. My children and I are delighted too! What a nice blog and article. I’m glad always glad to learn about eco-friendly toys that work for children past the toddler stage. Our life as consumers of eco-friendly toys seems light years away from that of our grandparents. But you don’t change human nature. Optimism, for me, is the belief that we can spread the opportunity for everyone to be fully human.